Ahmad Maaty and the Silkies perform “Gur Nalo Ishq Mitha” at Silk Road Dance Compay’s BOLLYWOOD FEVER concert, part of the 2013 Intersections Festival. 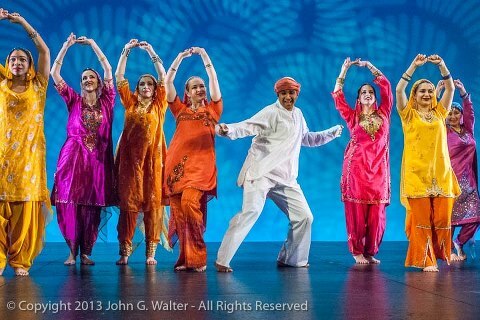 On March 2, 2013, the Silk Road Dance Company (SRDC) graced the stage of the Atlas Performing Arts Center’s Lang Theatre with their Bollywood Fever concert. Part of the annual Intersections Festival, this magnificent evening of sequin-clad escapism was beloved by more than just audience members; Bollywood Fever was a high-point of the performance season for many of the “Silkies,” as the members of Silk Road Dance Company are affectionately known. Kat, one of the Silkies involved in Bollywood Fever, perfectly summarized her feelings towards the show. According to her, the fun music and lighthearted energy that Bollywood dancing creates in the rehearsal studio make for a bright spot in her week. This sentiment is certainly shared by many of her sister Silkies. Bollywood is also a departure from the norm for Ahmad, an Egyptian-American dancer and actor who recently earned his MFA from Pace University. He usually performs Arabic and Uzbek dance with SRDC but ever since the company’s Artistic Director, Dr. Laurel Victoria Gray introduced him to the style, he has loved the friendly, warm, and inviting energy that Bollywood dance exudes. His favorite pieces in Bollywood Fever are two seeming opposites – the Rajasthani Ghoomar dance which he loves for its tribal, grounded, high-energy movement, and the Kathak-inspired Suno Re, a piece that he describes as ethereal and appreciates for the peaceful and pleasant break that it provides from the rest of the high-energy pieces in the show.